Picture it: you’re sitting in your backyard, enjoying the long summer night. Slowly, the smell of charcoal grills starts wafting through the neighborhood to your nose. You glance at your phone. It’s dinner time and you don’t have anything in the fridge! Your stomach rumbles grumpily. Heat grill to medium-high. In a large bowl, combine ground beef and Worcestershire and season with salt and pepper. Form into 4 patties. 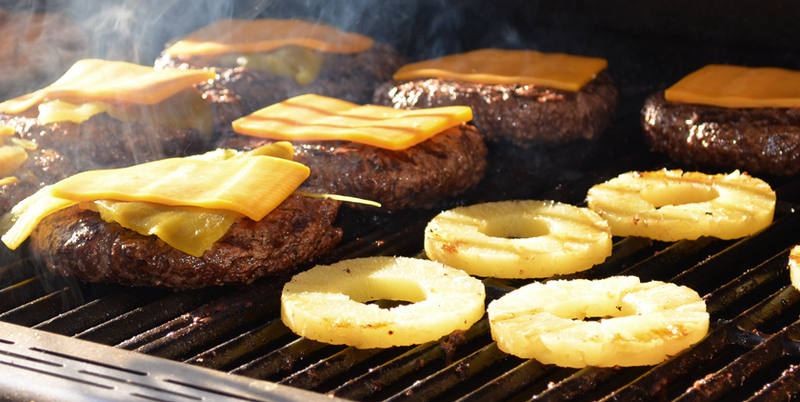 Grill patties, pineapple and red onion until charred, 3 minutes per side. Top burger patties with pepper jack and cover grill to let melt, 1 minute. Top bottom pineapple buns with lettuce, burger patties, bacon, and grilled onions, then top with pineapple bun. Using pineapple as a bun instead of bread is a simple way to enjoy a summer staple without adding unnecessary, processed carbs. Plus, you can’t get fresh produce all year round, so make sure to take advantage of the fact that pineapple is in season!